This is a condensed and edited version of an address given at the Getty Conservation Institute in October, 2004. 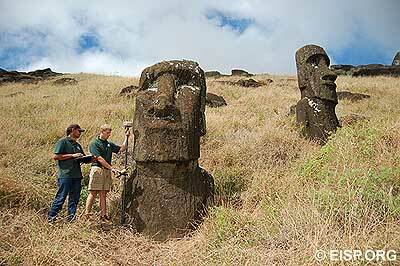 The Easter Island Statue Project (EISP) is an archaeological inventory designed to locate and document every monolithic stone sculpture (moai) on Rapa Nui. Our research purpose is to amass large quantities of objective data in standardized ways, and to employ data analysis strategies that enable recognition of principle motif patterns, define the design canon and illustrate cultural norms. This paper describes three aspects of the project: the collection and maintenance of raw data, database strategy and management, and statue environmental damage and condition assessment reports. (Left) A composite overhead image of moai C-7 in the Rano Raraku interior quarry. Separate digital photographs were taken from a camera mounted on a hand-held boom hoisted over the moai. An attached video monitor acted as a remote viewfinder. These photos were then composited together in Photoshop to make the overhead view. The context of this moai can be seen in this map. Digital compositing by Debra Isaac. 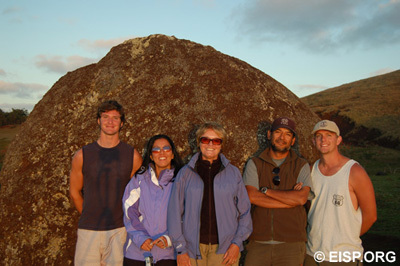 EISP field crew, 2006: Henry Debey, Alice Hom, Jo Anne Van Tilburg, Cristián Arévalo Pakarati, Matthew Bates. Within Rano Raraku archaeological zone, the published maps (Cristino et al. 1981) indicate 680 localized “features” and 529 “sites.” Unlike the published survey quadrant maps, however, twenty-one types of map icons define the class of object localized. The definition and relationship of site and feature, the boundaries of a given site, and the inferred use, function, or purpose of a site or feature cluster is not clarified. Our nomenclature drops the “site” and “feature” designation and re-defines them as surveyed “objects” located and mapped on the ground and capable of being considered as either sites or features, depending upon their individual circumstances. These objects, whether singly or in clusters, have been 1 of 6 flexible interpretive use or purpose descriptions (all widely acceptable in Easter Island studies). The EISP database has a survey identification code to denote 29 specific “object” types encountered in the field or in museum or archive collections. These object definition codes are clustered in 5 groups, with group 1 being Monumental Sculptural Objects (3-dimensional) and including moai and their frequently encountered, specific partial or complete forms. Our field goals during this season were to complete collection of mapping points in the interior Section D; to collect mapping points on all “in transport” statues no matter where they are located, and to re-locate and document all previously mapped, non-sculptural objects in the eastern and exterior quarries. 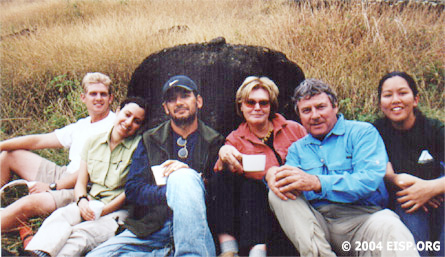 EISP Team 2004: Matthew Bates, Debra Isaac, Cristián Arévalo Pakarati, Jo Anne Van Tilburg, Bill White, Alice Hom. ©EISP/JVT/Photo: Bill White. Maps and images created by Chilean governmental agencies over three decades were reviewed in preparation for creating the published map of Rano Raraku in Cristino et al. Atlas Arqueólogica de Isla de Pascua, 1989. A key base document for the latter was the plan of the volcano created by Lt. D.R. Ritchie of the Mana Expedition to Easter Island, 1914. Five archaeological zones were created in Rano Raraku: interior and exterior slopes, interior and exterior quarries, and upper exterior quarries. Two quarry zones, designated C and D, in the interior, were outlined but not mapped. 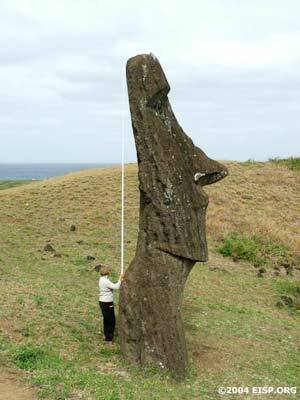 Jo Anne Van Tilburg measuring height of upright moai on exterior slope of Rano Raraku. ©EISP/JVT/Photo: Alice Hom. The goal of EISP’s seasonal mapping effort from 2002-2004 in the interior of Rano Raraku was to map all statues, outline the papa, and fully delineate the quarries in Areas C and D; to compile a contour map of the area showing the main topographical features, and to localize all previously mapped and numbered statues that are standing or fallen on the interior slopes. 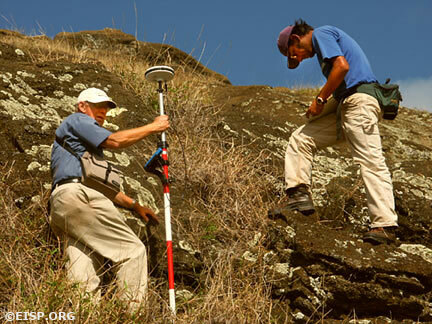 An existing GPS station approximately 10 km west of Rano Raraku was established by NASA in 1998. 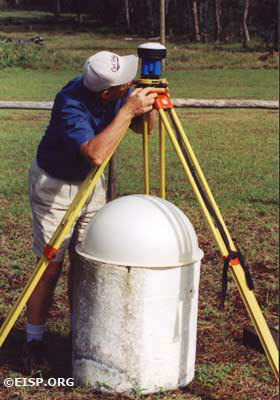 In 2000, we placed our survey on the GPS datum WGS 84 and the UTM (Universal Transverse Mercator) projection zone 12. This is the same projection as was used for the previous survey and, therefore, provides consistent data. We established four base stations in Rano Raraku on the south side of the volcano and marked each by steel pegs placed level with the ground. These are located away from the main path and not ordinarily visible to passersby. Another three points were established in Area C and marked by wooden pegs driven in flush with the ground. These pegs were also placed away from paths so that they would remain inconspicuous and undisturbed. The specific goal of the field season was to initiate the digital and standard photographic survey of Section D; to complete the sketch map and photographic survey of Section D, and to field check the previous season’s field work in Section C. The survey was previously placed on the UTM (Universal Transverse Mercator) projection zone 12 – the same projection as was used by the previous survey (Cristino et al. 1981 Atlas Arqueólogica de Isla de Pascua). There is, however, a significant difference between the 1978 map (cited above) and our survey. 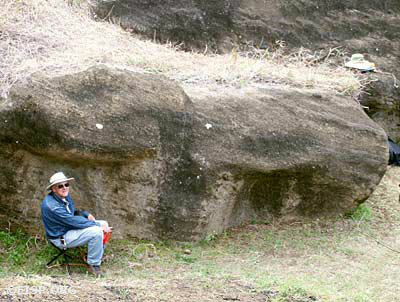 Our map is based on a modern Global Positioning Survey (GPS) using the new WGS 84 figure of the earth and will include detailed measurement of all moai in Section D.
Cristián Arévalo Pakarati constructed a hand drawn detail map of each quarry and statue located in Section D which he began last field season. This map, which compliments that accomplished in the previous season for Section C, contains on it the survey reference points. It will be used to illustrate specific archaeological and formal details of quarries and statues, and will serve as the reference guide for the computerized development via CAD of the GPS survey map described above. 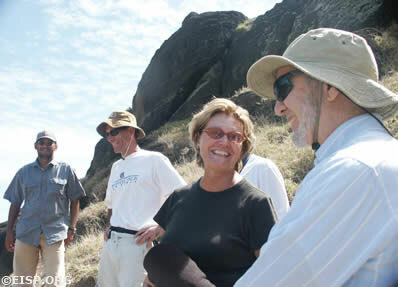 Cristián Arévalo Pakarati, Barry Rollett, Jo Anne Van Tilburg, and Jared Diamond at Rano Raraku. ©EISP/JVT/Photo: A. Hom. 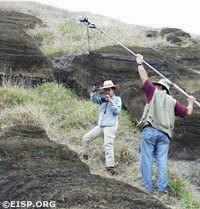 The specific goal of this field season was to augment previous efforts by accomplishing a digital and standard photographic survey of Section C. Further detailed measurements of all moai in Section C, as well as all of those standing outside of it on the quarry slopes, will also be accomplished. Cristián will initiate the sketch map of Section D, and Van Tilburg will field check the previous season’s field work in Section C as well as lay-out survey points for Section D. We previously used three single-frequency Ashtec GPS receivers, providing centimeter level accuracy, in our survey. It is based on an existing GPS station approximately 10 km west of the site. This station was set up by NASA in 1998 and placed our survey on the GPS datum WGS 84. The survey was previously placed on the UTM (Universal Transverse Mercator) projection zone 12 – the same projection as was used by Cristino et al in Atlas Arqueólogica de Isla de Pascua,1981. Thus, we will provide consistent data. There is, however, a significant difference between earlier maps and our survey. Our map is based on a modern Global Positioning Survey (GPS) using the new WGS 84 figure of the earth. The specific goal of the survey in Section C was to map every statue or possible statue and each quarry found within its boundary; to map the orientations and tilt of all prone, supine, lateral statues in relationship to Section C; to map every standing statue in the interior, and to compile a contour map of the area showing the main topographical features. We used three single-frequency Ashtec GPS receivers, providing centimeter level accuracy. The survey is based on an existing GPS station approximately 10 km west of the site. This station was set up by NASA in 1998 and placed our survey on the GPS datum WGS 84. 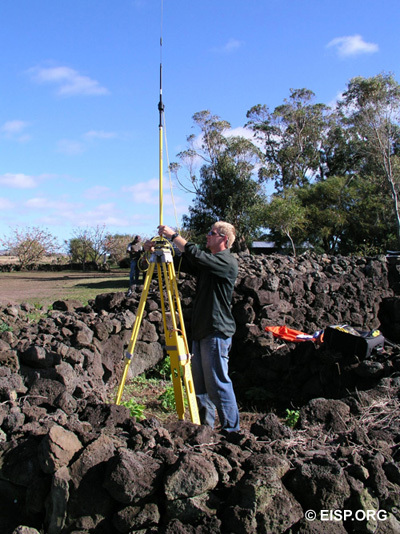 Four base stations were established in Rano Raraku in relation to Section C, and were marked by steel pegs placed level with the ground. These were covered by grass and placed away from the main path so that they are not visible or dangerous to tourists or others. Another three points will be established in the working area Section D and will be marked by wooden pegs, also flush with the ground and away from the path. All pegs will be left in place; we will use them during the remaining of the survey work, and then they will be removed. Cristián Arévalo Pakarati and Matthew Bates survey the interior quarry slopes. Dynamic geographic data sets are essential to describing and interpreting the interaction of natural and human phenomena on the Rapa Nui cultural landscape. During field work conducted in Rano Raraku interior between 2005 and 2007, and in the laboratory, we examined moai presence in terms of regional territories within Rano Raraku and as a byproduct of habitual production, use, discard and reuse behaviors not directly tied to socio-political boundaries, status restrictions or resource display demands. Reviewing the copious literature dealing with Easter Island, many conflicting figures for the land surface of the island are published. All of them are clearly inaccurate. Given that many colleagues and interested people consult about this problem, we are now updating this information using the best available maps and techniques. The surface of Easter Island was calculated based on air-photogrammetric digital mapping developed by IGM (Instituto Geográfico Militar de Chile), in August 2004, based on air photographs, scale 1:25.000, taken by SAF (Servicio Aerofotogramétrico de la Fuerza Aérea de Chile) in 1981. For the vectorial cartography, the Geodetic Reference System SIRGAS(WGS84) in UTM projection zone 12 (central meridian 111°W) were used, designed for graphic plots to scale 1:10.000, with contour lines every 5 meters. Our calculations show that the exact value of the area included by the projected coastal polygon of Easter Island is of 16,357.4026 hectares and, after applying the reciprocal square of the UTM mean scale factor for the island, a corrected value of 16,359.7354 hectares or 40,425.6209 acres is obtained, as effective for the zero contour at mean sea level. Thus, the surface of Easter Island rounded to the nearest decimal, is of 163,6 square kilometres or 63,2 square miles.